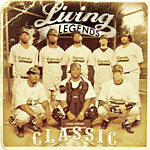 Amazing Living Legends crew album! This is one album that truly lives up to its name - exceeds expectations! Most of the album was recorded in February 2004 when the eight Living Legends were all staying together in a house for a month on Maui. That was the first time in recent memory all eight members were together with the purpose of recording a new project and what came out of those sessions is definitely their strongest material yet. The cover photo shows all eight LL members: (from left to right, top row first) Murs, Scarub, Bicasso, Eligh, Aesop, Sunspot Jonz, Luckyiam (PSC), and The Grouch. Production by Madlib, Eligh, Grouch, Sunspot, DJ Khalil, Kruse, DJ Epik, and Bean One.